Diabetic nephropathy is the kidney complication of diabetes mellitus and leading to end stage renal disease. In the past, reconstructed antidiabetic combination from Trigonella foenum-graecum (fenugreek) seeds (IND01) containing 4-hydroxyisoleucine (40%), trigonelline (30%) and galactomannan (30%) showed excellent antihyperglycemic activity. The objective of the present study was to evaluate the renoprotective efficacy of IND01 in animal model of diabetes with and without ischemia reperfusion injury. The diabetes was induced by alloxan in dose of 160 mg kg-1, intraperitoneally (early nephropathy model, without ischemia reperfusion) or 70 mg kg-1, i.v. (model with ischemia reperfusion). In both models, effects of oral treatment of IND01 (50, 100 and 200 mg kg-1, daily once for 30 days) were observed on biochemical parameters (creatinine clearance) and urine (blood urea nitrogen). On day 30, rats were sacrificed and histology was performed on isolated kidneys. Alloxan administration with or without ischemia reperfusion showed symptoms of severe nephropathy (decreased creatinine clearance, increased BUN, presence of glomerular matrix formation, tubular necrosis, interstitial inflammation and fibrosis). The daily oral administration of IND01 (50-200 mg kg-1) showed potent and mild renoprotective effects on biochemical parameters against diabetic rats without ischemia (early nephropathy) and with ischemia model respectively. IND01 showed moderate protection from histological abnormalities in kidney of alloxan-induced rats without ischemia reperfusion injury (early nephropathy model). However, such protection was not offered by IND01 in alloxan induced rats with ischemia reperfusion injury. In conclusion, IND01 showed renoprotection in animal model of early nephropathy probably by effective glycemic control. Diabetic nephropathy (DN) is the kidney disease that occurs as a result of diabetes mellitus (DM). DN is the single most common disorder leading to renal failure (Sampanis, 2008). Between 20 and 40% of patients with diabetes, eventually develop DN, which is the leading cause of end-stage renal disease (ESRD) and needs dialysis or kidney transplant (Sampanis, 2008). Both clinical and experimental data suggest that hyperglycemia increases the risk of acute renal failure (Wald et al., 1990). Conversely, ischaemiareperfusion (I/R) combined with hyperglycemia could also be important in the development of diabetic nephropathy (Melin et al., 2003). After many years of DM, the delicate filtering system in the kidney gets destroyed, becoming leaky to large blood proteins such as albumin that are lost in urine. Its incidence and prevalence has increased to alarming proportion in the past decade despite recent therapeutic advances. In patients with longer lasting DM, particularly in the so-called decompensated DM, the occurrence of specific and non-specific chronic complications are common (Brilla, 1997). DN is a result of interaction of metabolic and haemodynamic factors. Glucose-dependant pathways are activated within the diabetic kidney. The causes for this activation include increased oxidative stress, renal polyol formation, advanced glycated end-products (AGEs) accumulation and presclerotic cytokines, such as transforming growth factor-β1 (TGF-β1). These pathways eventually lead to increase in renal albumin permeability and extra cellular matrix build-up, which results in increasing proteinuria, glomerulosclerosis and tubulointerstitial fibrosis. DN patients need to maintain the vital functions and improve the quality of life. This objective is only possible by reducing the need of dialysis and improving their renal functions to normal levels. Currently, Angiotensin Converting Enzyme (ACE) inhibitors and angiotensin-II (AT-II) receptor blockers are used to treat DN. Although, these drugs are useful, they need to be monitored as they may have detrimental effects in some people. Novel targets, which are linked to glucose dependent pathways, are the major focus of new therapies directed against diabetes induced renal damage. It is likely that resolution of DN will require synergistic therapies to target multiple mediators of this disease (Bachar and Lichtstein, 1993). Hence, the nephropathic population of patients is in dire need for alternate medication. Fenugreek (Trigonella foenum-graecum L. Family: Leguminosae), a spice rich in dietary fibres has traditional history of medicinal use in the management of diabetes. Anecdotal report suggest a 3000 year old history of medicinal use for fenugreek in Egypt, Southern Europe, India, Asia and northern Africa (WHO, 2007). In recent decades, several health beneficial physiological attributes of fenugreek seeds have been reported in animal studies as well as human trials (Ulbricht et al., 2007; Kang et al., 2008). Trigonella foenum-graecum seeds have previously been shown to have hypoglycemic and hypocholesterolemic effects on type 1 and type 2 DM patients (Sharma et al., 1990; Gupta et al., 2001; Yadav et al., 2008) and experimental diabetic animals (Jelodar et al., 2005; Abdelatif et al., 2012). Trigonella foenum-graecum seed extract showed improvement in diabetic rats in a dose-dependent manner (Xue et al., 2007). The parameters like kidney to body weight ratio, blood glucose, glycated haemoglobin (HBA1c), triglycerides, total cholesterol and higher-density-lipoprotein-cholesterol lipid peroxidation and antioxidant status and hemorheological properties were improved in alloxan-induced diabetic rats (Xue et al., 2007). Recently, efficacy of fenugreek oil in to ameliorate DM and improvement in renal toxicity is reported (Hamden et al., 2010). Oral administration of fenugreek seed powder for 3 weeks in alloxan-induced diabetic rats stabilized glucose homeostasis and free radical metabolism in kidney (Thakran et al., 2003). Further, protective effects of fenugreek seed powder on kidney histology of toxicant-induced kidneys are reported (Thakran et al., 2004; Sushma and Devasena, 2010). However, the exact composition responsible for beneficial effect on DM induced renal complications is yet challenge. Fenugreek seed mainly contain 4-hydroxyisoleucine (4-HI), trigonelline, galactomannan with flavonoids, carotinoids, coumarins, proteins, saponins and lipids (Al-Habori et al., 2001; Basch et al., 2003). Individual constituents of fenugreek seeds like 4-HI (Sauvaire et al., 1998; Broca et al., 2000; Broca et al., 2004; Narender et al., 2006; Singh et al., 2010), trigonelline (Mishkinsky et al., 1967; Shah et al., 2006a), galactomannans (Hannan et al., 2003; Hannan et al., 2007; Kamaljit et al., 2011) demonstrated potent antidiabetic effect in animals. 4-HI has been found to be a major free amino acid in the seeds (Sauvaire et al., 1976). Trigonelline is a major alkaloid constituent of the fenugreek seeds (Mishkinsky et al., 1967). Galactomannans are polysaccharides consisting of mannose backbone with galactose side groups. The defatted fenugreek seed contains about 40% of 4-HI, 30% of trigonelline and 30% of galactomannan. In the past, we have reported antihyperglycemic activity of reconstructed composition of fenugreek seeds, IND01, which contains 4-HI (40%), trigonelline (30%) and galactomannan (30%) (Shah et al., 2006b). IND01 also reported to have synergistic antihyperglycemic interaction with synthetic antihyperglycemic molecules like pioglitazone and glyburide (Shitole et al., 2009). However, effects of IND01 on renal complications of diabetes are yet unknown. The aim of present work was to evaluate effects of long-term treatment of IND01 in kidneys of diabetic rats with or without renal I/R. Drugs and chemicals: The preparation of IND01 involve the extraction, isolation and characterization of 4-HI, trigonelline and low molecular weight galactomannan and was carried out as per reported methods (Shah et al., 2006a,b; Shah et al., 2009). These isolated phytochemicals were mixed in proportion of 40:30:30, respectively to get reconstructed composition product, IND01. The test solution of IND01 was freshly prepared in by dissolving in distilled water in concentration of 100 mg mL-1 and was administered to animal based on body weight. Alloxan monohydrate (Sigma-Aldrich, USA. ), pioglitazone (Ajantha Pharma Pvt. Ltd., India) and insulin: (Mixtard 30 HM, 40 IU mL-1 Novo Nordisk) and anaesthetic ether (TKM Pharma, Hyderabad, India) were purchased from respective vendors. Biochemical kits for estimation of creatinine (Jaffe method), urea (Enzymatic method) and glucose (Accurex Biomedical Pvt. Ltd., Mumbai, India) were purchased respective vendors. Animals: Male Wistar rats (150-200 g) were purchased from National Toxicology Centre, Pune. During the experiment, rats were housed at standard housing condition like temperature of 25±1°C, relative humidity of 45-55% and 12 h. light: 12 h dark cycle. Research protocol was approved by Institutional Animal Ethics Committee (IAEC) of Poona College of Pharmacy, Bharati Vidyapeeth Deemed University, Pune. The rats had free access to food pellets (Amrut Laboratory, Navmaharashtra Chakan Oil Mills Ltd., Sangli, India) and tap water ad libitum during the experiments. Early nephropathy in diabetic rats (Mishra et al., 2010): All rats except those of Group I, i.e., normal or Non-diabetic, were treated with alloxan (160 mg kg-1, i.p.) to induce hyperglycemia and diabetes. Serum Glucose (SG) levels of rats were determined after 48 h of injection (day 0 of study) using Accurex glucose estimation kits. Rats with serum glucose above 300 mg dL-1 were selected. The selected diabetic rats were divided into group II to VI of 6 rats each. Rats of group II and III were orally gavaged with distilled water (1 mL kg-1) and standard antidiabetic agent, pioglitazone (10 mg kg-1) once a day for 30 days, respectively. Rats from group IV, V and VI were orally gavaged with IND01 at dose of 50, 100 and 200 mg kg-1, respectively once a day for 30 days. The biochemical parameters of all rats were measured on 0, 15 and 30th day and histological studies were done on kidney samples after sacrifice on 30th day. Renal I/R injury in diabetic rats (Melin et al., 2002): All rats except those of Group A, i.e., normal or Non-diabetic, were treated with alloxan (70 mg kg-1, i.v.) to make them diabetic. Serum Glucose (SG) levels of rats were determined after 48 h of injection (day 0 of study) using Accurex glucose estimation kits. Rats with SG levels above 300 mg dL-1 were selected for this study. Selected rats were randomly divided into groups of 6 rats (Group B to G). Seven days before induction of renal I/R, Group A, B and C had received once daily treatment of vehicle (distilled water) for 7 days before I/R surgery. Rats in Group D were pretreated with insulin (8 IU, s.c.) daily for 7 days. Rats from group E, F, G were pretreated with IND01 (50, 100 and 200 mg kg-1, p.o. daily once), respectively for 7 days. After completion of 7 days of pretreatment (Day 0 of study), renal I/R was induced in the rats of group C to G. Group B rats, called as sham control, had small cut in skin but no I/R induction. Group A rats (Normal) neither had I/R or cut to the skin. The rats form group C, D. E. F and G were anaesthetized by intraperitoneal (i.p.) injection of thiopental sodium in a dose of 50 mg kg-1. During the operation the animals were placed on a servo-controlled heating pad keeping the body temperature at 37.5°C. A left flank incision was made and the left renal artery was located and dissected free from its surrounding structures. After a recovery period of 10 min, a small midline incision was made to isolate left renal artery and clamped for 30 min. Subsequently the wound in the abdomen was sutured, povidone iodine ointment was applied and animals were housed individually in cages. The rats were then allowed to recover and dosing was continued as mention above till day 30th day after surgery. Blood and urine samples were collected on 0, 10, 20 and 30th day after surgery for biochemical and renal function estimations. Histopathology of kidneys in diabetic rats (Melin et al., 1997; Melin et al., 2002): On 30th day, after collection of urine and serum, the animals were sacrificed. Their kidneys were removed, stored in 10% formalin until dissected. At the time of dissection, kidneys were divided into two halves (parallel to major axis) and washed. These tissues were processed for 12 h using isopropyl alcohol and xylene and embedded in paraffin. Paraffin embedded tissues were sectioned (5 μm thickness) and stained using haematoxylin and eosin (H and E). Histological changes in the glomeruli, tubules, interstitium and blood-vessels were recorded for each specimen by photomicrographic examination with light microscope (Olympus, USA) fitted with camera (Nikon E200). Renal changes were scored using a scale of none (-), mild (+), moderate (++) and severe (+++) damage. Statistical analysis: Data was expressed as Mean ± SEM for each biochemical parameter. Data for CCr and BUN was separately analyzed by two way ANOVA followed by Bonferroni Posttest for each model. p<0.05 was considered statistically significant. Effect of IND01 on creatinine clearance (CCr) in alloxan-induced DN in rats without I/R: Alloxan (160 mg kg-1, I.p.) injection significantly reduced CCr as compared with non-diabetic (normal) rats within 48 h.
This fall suggests induction of kidney dysfunction by alloxan. The fall in CCr was sustained during the study period of 30 days (Table 1). Daily once treatment of pioglitazone (10 mg kg-1, p.o.) and IND01 (200 mg kg-1, p.o.) in alloxan-induced rats (group 2) improved CCr from 15th days of treatment. Lower dose of IND01 (50 and 100 mg kg-1, p.o.) treatment improved CCr on day-30. Effect of IND01 on Blood Urea Nitrogen (BUN) in alloxan-induced DN in rats without I/R: Sustained increase (p<0.001) in BUN levels were observed in alloxan-treated (diabetic) rats as compared normal (non-diabetic rats). Moreover, BUN levels were significantly higher on day 30 from baseline (day 0) (Table 1). Pioglitazone treatment significantly (p<0.001) lowered BUN levels from day-15 onwards. IND01 treatment showed significant decrease in BUN levels only after 30 days of treatment (Table 1). Effect of IND01 on creatinine clearance (CCR) in alloxan-induced DN in rats with I/R: Alloxan (160 mg kg-1, i.p.) pretreatment brought significantly sharp fall in CCr compared with non-diabetic (normal) as well as diabetic sham control rats within 48 h. This fall suggests induction of reduced kidney function in diabetic rats. The fall in CCr was sustained in the study period of 30 days. Daily treatment of Insulin (8 IU, s.c.) and IND01 (100 and 200 mg kg-1, p.o.) to renal I/R in diabetic rats showed improved CCr form at baseline (48 h. after diabetes induction). Insulin produced significant CCr improvement compared with diabetes with I/R rats till day 20 of study. Improvement in IND01 treated rats did not sustain beyond 10 days (dose 200 mg kg-1). On day-30, neither Insulin nor IND01 showed significant improvement in CCr compared with diabetes rats with I/R (Table 2). Effect of IND01 on Blood Urea Nitrogen (BUN) in alloxan-induced DN in rats with I/R: Sustained increase (p<0.001) in BUN levels in alloxan treated rats were found as compared normal (non-diabetic rats) and BUN levels were significantly higher form baseline (day 0) to 30-days (Table 3). Pioglitazone treatment significantly (p<0.001) lowered BUN levels from day-15 onwards. IND01 treatment showed significant decrease in BUN levels only after 30 days of treatment (Table 3). At baseline (48 h. after diabetes induction), BUN levels in ischemic-injured diabetic rats were found as significantly higher (p<0.001) compared to non-diabetic and diabetic sham control rats. Significantly (p<0.001) higher BUN levels were observed in ischemic-injured diabetic rats during the study period of 30 days. Insulin (8 IU, s.c., once a day) treatment did not show significant rise in BUN as shown by ischemic-injured diabetic rats (Table 2). On 30-days of pre-treatment, IND01 (50 or 100 mg kg-1, p.o., once daily), did not show any reduction in BUN in Ischemic-injured rats. However, at dose of 200 mg kg-1, p.o., IND01 showed mild (p<0.05) reduction from raised BUN levels as compared with ischemic-injured diabetic rats. Effect of IND01 on histology of kidneys in alloxan-induced DN in rats without I/R: The histological observations of sections of kidneys of alloxan treated rats showed hyperplasia of mesangium, glomerular basement membrane thickening, tubular atrophy and interstitial inflammation of mild to moderate intensity confirming induction of nephropathy (Table 4 and Fig. 1). These changes were absent in rats treated with pioglitazone and IND01 (200 mg kg-1) which confirms renoprotective action as well as antihyperglycemic effects. However, lower doses of IND01 (50 and 100 mg kg-1), caused certain degree (although mild in intensity) of hyperplasia of mesangium and glomerular basement membrane enlargement. Except normal (non-diabetic) rats, moderate tubular atrophy, tubular dilation and interstitial inflammation was noted in all the kidney samples (including kidneys of IND01 and pioglitazone treated diabetic rats), which suggest irreversible nature of tubular atrophy in diabetic nephropathy. 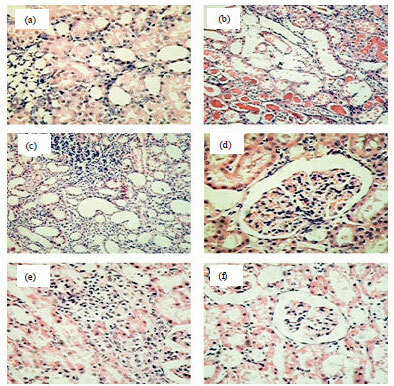 Effect of IND01 on kidney histopathology in alloxan-induced DN in rats with I/R: The histological observations of sections of kidneys of ischemic-injured diabetic rats showed moderate to severe (++ to+++) glomerular cellularity, glomerular matrix formation, tubular necrosis with dilatation, interstitial inflammation and fibrosis. Diabetic sham control rats also showed mild changes in kidney morphology (Table 5 and Fig. 2). In our study, insulin treatment caused complete prevention in kidney sections with respect to glomerular cellularity and matrix formation during 30 days of period whereas IND01 treatment prevented these changes partially. Mild to moderate tubular necrosis with dilatation, interstitial inflammation and fibrosis were observed in all the kidney sections, which suggest irreversible nature of tubular atrophy. These changes were severe in Ischemic-injured diabetic rats. The rats treated with Insulin or IND01 for 30 days showed only mild changes compared to rats having diabetes and I/R (Table 5). One of the specific chronic complications is represented by the finding of diabetic nephropathy that is characterized by proteinuria, frequent hypertension and slow gradual alteration of renal functions. In a narrow sense of the word, diabetic nephropathy is referred to as microangiopathic impairment of kidneys. Fenugreek as a diet supplement causes a marked decrease in symptoms of diabetes in terms of polydypsia, polyuria, urine sugar, renal hypertrophy and glomerular filtration rate (Shetty and Salimath, 2009). In the present study, we investigated effects of reconstructed composition of Trigonella foenum-graecum L. seeds. Each ingredient in fenugreek extract has different chemical constituents with complex molecular formulae, which must be beneficial for different aspect of diabetes management (Hassanzadeh et al., 2011). Another challenge is consistency in quality and efficacy of composition (Ansari and Inamdar, 2010; Sarwar et al., 2011). The present study was an attempt to study optimized composition for the therapeutic effects in the animal model of renal complication of DM. IND01 is reconstructed composition which contains active ingredients of fenugreek seeds in same proportion as they found in nature. In the present study, alloxan with or without renal ischemic-injury produced severe biochemical or histological in rats kidneys. CCr levels were decreased and BUN levels were increased in diabetic as well as renal I/R with diabetic rats. These results are consistent with earlier reports on alloxan model (Spadella et al., 1998) and effect of pioglitazone (Stendig-Lindberg, 1992). In the present study, consistent decrease in CCr in the diabetic rats with and without renal I/R was observed. IND01 showed dose-dependent improvement in CCr in alloxan induced diabetes rats after 30 days of treatment. In the diabetic rats with renal I/R , pretreatment of IND01 for 7 days could offer only moderate reversal of CCr. The protective effects of IND01 on CCr were found be decline over the period of 30 days (Table 3). On the other hand, administration of insulin (8 IU, s.c.) prior to I/R in diabetic rats offered consistent improvement in CCr during the study period in diabetic rat with I/R (Table 3). CCr is an effective means of assessing renal function and useful indicator of glomerular filtration rate (GFR). CCr is the removal of creatinine from the body and defined as the volume of blood plasma that is cleared of creatinine per unit time. The pathophysiology of DN involves glucose that binds irreversibly to proteins of kidneys and AGEs, that can form complex cross-links over years of hyperglycemia. DN can cause renal damage by stimulation of growth and fibrotic factors via receptors for AGEs. Increased glomerular capillary pressure occurs early in diabetes and is associated with hyperfiltration at the glomerulus. The glomerular mesangium expands, initially by cell proliferation and then by cell hypertrophy. Increased mesangial stretch and pressure, as well as high glucose levels, can stimulate this expansion. Besides, the role of glycosylation of proteins is involved in alloxan induced DN model in animals (El-Mekawi et al., 1993). Higher level of glycosylation of urinary proteins after alloxan induced diabetes rats after 7 days of treatment had been reported earlier (El-Mekawi et al., 1993). Therefore, ability of any compound in reversing renal dysfunction point to good control of glycosylation of protein. In present study, the protection from renal dysfunction by IND01 in early-stage diabetic nephropathy can be attributed to probable fall in AGEs and improved glycemic control. Fenugreek has been reported to improve glycemic control and glycated haemoglobin (HBA1c) status in diabetes patients (Gupta et al., 2001; Kassaian et al., 2009) and animals (Devi et al., 2003; Xue et al., 2007). Galactomannan from fenugreek is especially reported for this purpose (Srichamroen et al., 2008). Similar effects were noted in terms of BUN measurements in the present study. IND01, pioglitazone and insulin showed significant improvement of BUN levels in the doses tested against diabetes with or without renal I/R. However, onset of action to achieve the protection was quickest for Insulin (48 h after diabetes with renal I/R) followed by pioglitazone (15 days in diabetes without I/R) and IND01 (30 days in both models). IND01 at a dose as low as 50 mg kg-1, p.o., showed potent protective effects in diabetic rats (without I/R). In presence of renal I/R in diabetic rats, IND01 could only produce mild effects at highest dose (200 mg kg-1) after 30 days of treatment. This observation is consistent with earlier report that insulin offers renal protection from I/R when improved metabolic control is achieved before renal I/R (Melin et al., 2002). The control of hyperglycemia before I/R is important for renoprotective action of insulin and IND01 in diabetes in presence of renal I/R. BUN measurement is another kidney function assessment test. Urea is a by-product of protein metabolism and is formed in the liver. Urea is excreted in urine and undergoes tubular reabsorption. Because of tubular atrophy in DM, tubular reabsorption of BUN is affected. Therefore, high amount of BUN in the diabetic rats with or without renal I/R indicate impairment of tubular reabsorption which was also observed in our study. The changes in kidneys that can be evaluated histopathologically depend on the duration of diabetes and how diabetes was treated. In short-lasting untreated diabetes, character of diabetic nephrosis is found to be manifested microscopically in diabetic patients (Farquhar et al., 1959; Meoro et al., 1999; Rosai and Ackerman, 2004) as well as alloxan-induced rats (Bartosikova et al., 2003). In the present study, sections of kidneys of diabetic rats with and without I/R showed cellularity, glomerular matrix formation, tubular necrosis with dilatation, interstitial inflammation and fibrosis. The intensity of kidney damage was severe (+++) with I/R whereas moderate damage (++) was observed without I/R. Daily oral administration of IND01 (50-200 mg kg-1) for 30 days seems to provide moderate (++) protection from histological abnormalities in kidneys of early experimental DM (without I/R). However, such protection was not offered by IND01 in diabetes with I/R model. Alloxan is known to produce tubular atrophy, interstitial inflammation, hyperplasia of mesangium and glomerular basement membrane enlargement. These renal changes are because of high glucose levels present for longer period in the diabetic rats. There is growing evidence that hyperglycemia results in altered renal oxygen metabolism and decreased renal oxygen tension and that these changes are linked to altered kidney function (Shafrir and Gutman, 1993). Current evidence suggests the selective cytotoxicity of alloxan is because of efficient uptake, oxidant production by redox coupling of alloxan with intracellular reductant (ascorbate and thiols) coupled with low levels of glutathione peroxidase in the islets (Malaisse, 1982). Much of the evidence concerning the role of oxidative stress in the induction of DM comes from the studies of alloxan which produces diabetes in experimental animals (Wolff, 1993; Balkis et al., 2008). Alloxan selectively destroys the islets of Langerhans by oxidant production, enhances lipid peroxidation and susceptibility to oxidative stress associated with depletion of antioxidants in liver, kidney and pancreas (Anuradha and Ravikumar, 2001). Alloxan toxicity in vitro and in vivo can be inhibited by many free radical scavengers and lipid-soluble antioxidants (Malaisse, 1982; Wolff, 1993). Therefore, alloxan-induced DM served as pathological bio-model for testing a substance with supposed antioxidative activity in vivo. Fenugreek seeds have been shown to have potent antioxidant effects and protect many vital organs in the body against oxidative stress induced by alloxan (Ravikumar and Anuradha, 1999; Anuradha and Ravikumar, 2001; Al-Wabel et al., 2008; Al-Matubsi et al., 2011; Premanath et al., 2011). Therefore, antioxidant potential can also envisaged as possible mechanism for renal protection shown by IND01 in the present study. However, antioxidant activity in fenugreek seeds was primarily attributed to the presence of flavonoids and polyphenols (Dixit et al., 2005). The absence of flavonoids and/or polyphenols in test composition (IND01) in present study pointed towards mechanisms other than anti-oxidant potential. On the other hand, sustained hyperglycemia caused by alloxan administration results into many biochemical and histological abnormalities and lead to nephropathy in rabbits (Winiarska et al., 2008), mice (Nordquist et al., 2008) and rats (Macedo et al., 2007). Further, chronically hyperglycemic alloxan diabetic rats showed reduced glomerular filtration rates renal plasma flow (p-aminohippurate clearance) and extracellular fluid volume associated with urinary Na+ losses which eventually reduces GFR (Di Loreto et al., 2004). It has been postulated that glomerular hyperfiltration or elevated GFR in early diabetes may eventually cause glomerular damage, leading to a progressive loss of renal function (diabetic nephropathy). Diabetic rats with long-term moderate hyperglycemia, however, do not develop characteristic glomerular lesions of human diabetic nephropathy and, in fact, develop only minimal glomerular injury even after 1-year of diabetes (ODonnell et al., 1988). Long-term diabetes in animals could accelerate the formation of the intercellular matrix of glomerular loops in proliferative glomerulitis in rabbits, resulting in accelerated glomerulosclerosis (Wanibuchi et al., 1991) and further worsens the nephropathy. Thus, although the diabetic rat with moderate hyperglycemia (induced by alloxan or streptozotocin) may be useful to study the mechanisms in early diabetes, it may not be an appropriate model of renal failure in IDDM (ODonnell et al., 1988). On the other hand, I/R combined with hyperglycaemia can mimic important mechanisms to develop ESRD and/or diabetic nephropathy in diabetic animals (Melin et al., 2003). Hyperglycemia is known to aggravate the renal injury and causes acute renal ischemia in the rat (Podrazik et al., 1989). An exceptional susceptibility to unilateral renal I/R injury resulting in inflammation, fibrosis, atrophy of the kidney and ESRD had been demonstrated in the diabetic rat (Melin et al., 2002). Studies also showed that a brief I/R results in a progressive injury leading to end-stage renal failure (similar to ESRD) in diabetic animals (Melin et al., 1997; Melin et al., 2002). In DM animals renal I/R caused massive induction of apoptosis in the renal medulla after six hours as well as inflammation, fibrosis, renal atrophy and anuria within four weeks (Melin et al., 2002). Several mechanisms have been suggested to explain why hyperglycaemia increases I/R injury. Intracellular oxidative has been proposed as a unifying explanation for most metabolic alterations in diabetes (Brownlee, 2001) I/R is also a state where oxidative stress has been implied in case of renal ischemic injury (Chien et al., 2001). It could be speculated that the combined oxidative stress from these two sources (diabetes and I/R) could be especially harmful. The increased inflammatory response after I/R in diabetes may play a role in increased sensitivity to I/R in diabetes (Panes et al., 1996). The beneficial effects of IND01 on CCr in both the models and mild reduction shown in basement membrane enlargement (in diabetic I/R model) were observed in present study. The results support hypothesis for antiinflammatory and/or antioxidant activity as potential mechanism of renoprotective action of IND01 Besides the glomerular changes, interstitial fibrosis and infiltration of inflammatory cells are important features of diabetic nephropathy (Bohle et al., 1991). In fact, the degree of tubulointerstitial injury is as closely related to the decline in function as are the glomerular alterations (Bader et al., 1980). The tubulointerstitial fibrosis and infiltration of inflammatory cells observed in diabetic rats after renal I/R share similarities with diabetic nephropathy (Melin et al., 1997). In the past, aqueous extract of fenugreek has been reported to have antiinflammatory activity (Vyas et al., 2008; Subhashini et al., 2011). Fenugreek leaves extract has been shown potent anti-inflammatory effects in animals of inflammation (Ahmadiani et al., 2001). Because of presence of alkaloids and absence flavonoids, saponins, or steroids in fenugreek leaves extract, authors suggested alkaloid as a responsible constituent for antiinflammatory potential of fenugreek. Therefore, the protective effect shown by IND01 can be partly attributed by presence of an alkaloid constituent, trigonelline. In the past, many natural and synthetic analogs of leucine (an amino acid) also showed antiinflammatory potential (Somasundaram et al., 1983; Turek et al., 1991; Bator et al., 1992; Serebruany et al., 1995). Therefore, possible contribution of 4-hydroxyisoleucine in the renoprotective action (through antiinflammatory mechanism) against diabetes cannot be ruled out. In conclusion, IND01 showed potential for renal protection against diabetic rats with or without renal I/R. The effects seem to be medicated through effective glycemic control. The authors would like acknowledge Dr. S. S. Kadam, Vice-Chancellor and Dr. K.R. Mahadik, Principal, Poona College of Pharmacy, Bharati Vidyapeeth University, Pune, India and Sunil Bhaskaran, MD, Indus Biotech Private Limited, Pune for providing necessary facilities to carry out the study. Ahmadiani, A., M. Javan, S. Semnanian, E. Barat and M. Kamalinejad, 2001. Anti-inflammatory and antipyretic effects of Trigonella foenum-graecum leaves extract in the rat. J. Ethnopharmacol., 75: 283-286. Al-Habori, M., A. Raman, M.J. Laurence and P. Skett, 2001. In vitro effect of fenugreek extracts on intestinal sodium-dependent glucose uptake and hepatic glycogen phosphorylase A. Int. J. Exp. Diabetes Res., 2: 91-99. Al-Matubsi, H.Y., N.A. Nasrat, G.A. Oriquat, M. Abu-Samak, K.A. Al-Mzain and M. Salim, 2011. The hypocholesterolemic and antioxidative effect of dietary diosgenin and chromium chloride supplementation on high-cholesterol fed Japanese quails. Pak. J. Biol. Sci., 14: 425-432. Al-Wabel, N.A., H.M. Mousa, O.H. Omer and A.M. Abdel-Salam, 2008. Biological evaluation of aqueous herbal extracts and stirred yoghurt filtrate mixture against alloxan-induced oxidative stress and diabetes in rats. Int. J. Pharmacol., 4: 135-139. Ansari, J.A. and N.N. Inamdar, 2010. The promise of traditional medicines. Int. J. Pharmacol., 6: 808-812. Anuradha, C.V. and P. Ravikumar, 2001. Restoration on tissue antioxidants by fenugreek seeds (Trigonella foenum graecum) in alloxan-diabetic rats. Indian. J. Physiol. Pharmacol., 45: 408-420. Bachar, H. and D. Lichtstein, 1993. Distribution of atrial natriuretic peptides in the sand rat (Psammomys obesus) in comparison to that in the rat. J. Basic Clin. Physiol. Pharmacol., 4: 47-56. Bader, R., H. Bader, K.E. Grund, S. Mackensen-Haen, H. Christ and A. Bohle, 1980. Structure and function of the kidney in diabetic glomerulosclerosis. Correlations between morphological and functional parameters. Pathol. Res. Pract., 167: 204-216. Balkis, B.S., R. Nor Fadilah, A. Ezlan, O. Khairul, A.B. Mokhtar and M. Jamaludin, 2008. Oxidative stress and DNA damage in streptozotocin-induced diabetic rats: Effects of alpha lipoic acid. J. Boil. Sci., 8: 622-627. Bartosikova, L., J. Necas, V. Suchy, R. Kubinova and D. Vesela et al., 2003. Monitoring of antioxidative effect of morine in alloxan-induced diabetes mellitus in the laboratory rat. Acta Vet. Brno, 72: 191-200. Basch, E., C. Ulbricht, G. Kuo, P. Szapary and M. Smith, 2003. Therapeutic applications of fenugreek. Altern. Med. Rev., 8: 20-27. Bator, J.M., M. Weitzberg and R.M. Burch, 1992. N-[9H-(2,7-dimethylfluorenyl-9-methoxy)carbonyl]-l-leucine, NPC 15669, prevents neutrophil adherence to endothelium and inhibits CD 11b/CD 18 upregulation. Immunopharmacology, 23: 139-149. Bohle, A., M. Wehrmann, O. Bogenschutz, C. Batz, C.A. Muller and G.A. Muller, 1991. The pathogenesis of chronic renal failure in diabetic nephropathy. Investigation of 488 cases of diabetic glomerulosclerosis. Pathol. Res. Pract., 187: 251-259. Brilla, C.G., 1997. Heart failure after myocardial infarct in decompensated diabetes mellitus. Acute therapy with catecholamines-long-term therapy with ace inhibitor-loop diuretic combination. Fortschr. Med., 115: 41-43. Broca, C., M. Manteghetti, R. Gross, Y. Baissac and M. Jacob et al., 2000. 4-Hydroxyisoleucine: Effects of synthetic and natural analogues on insulin secretion. Eur. J. Pharmacol., 390: 339-345. Broca, C., V. Breil, C. Cruciani-Guglielmacci, M. Manteghetti and C. Rouault et al., 2004. The insulinotrophic agent 1D1101(4-hydroxyisoleucine) activates insulin signaling in rat. Am. J. Physiol. Endocrinol. Metab., 287: E463-E471. Brownlee, M., 2001. Biochemistry and molecular cell biology of diabetic complications. Nature, 414: 813-820. Chien, C.T., P.H. Lee and C.F. Chen, 2001. De novo demonstration and colocalizationof free-radical production and apoptosis formation in rat kidney subjected to ischemia/reperfusion. J. Am. Soc. Nephrol., 12: 973-982. Cockcroft, D.W. and M.H. Gault, 1976. Prediction of creatinine clearance from serum creatinine. Nephron, 16: 31-41. Devi, B.A., N. Kamalakkannan and P.S.M. Prince, 2003. Supplementation of fenugreek leaves to diabetic rats. Effect on carbohydrate metabolic enzymes in diabetic liver and kidney. Phytotherapy Res., 17: 1231-1233. Di Loreto, V., H.S. Moreno, R.C. Puche and M.E. Locatto, 2004. Severe hyperglycemia: A determinant factor for hypofiltration in alloxan diabetic rats. Acta Diabetol., 41: 56-62. El-Mekawi, S., R. Yagil and N. Meyerstein, 1993. Effect of oxidative stress on avian erythrocytes. J. Basic Clin. Physiol. Pharmacol., 4: 199-211. Farquhar, M.G., J. Hopper and H.D. Moon, 1959. Diabetic glomerulosclerosis: Electron and light microscopic studies. Am. J. Pathol., 35: 721-753. Gupta, A., R. Gupta and B. Lai, 2001. Effect of Trigonella foenum-graecum (fenugreek) seeds on glycaemic control and insulin resistance in type 2 diabetes mellitus: A double blind placebo controlled study. J. Assoc. Physicians India, 49: 1057-1061. Hamden, K., H. Masmoudi, S. Carreau and A. Elfeki, 2010. Immunomodulatory, β-cell and neuroprotective actions of fenugreek oil from alloxan-induced diabetes. Immunopharmacol. Immunotoxicol., 32: 437-445. Hannan, J.M.A., B. Rokeya, O. Faruque, N. Nahar, M. Mosihuzzaman, A.K.A. Khan and L. Ali, 2003. Effect of soluble dietary fibre fraction of Trigonella foenum graecum on glycemic, insulinemic, lipidemic and platelet aggregation status of type 2 diabetic model rats. J. Ethnopharmacol., 88: 73-77. Hannan, J.M.A., L. Ali, B. Rokeya, J. Khaleque and M. Akhter et al., 2007. Soluble dietary fibre fraction of Trigonella foenum-graecum (fenugreek) seed improves glucose homeostasis in animal models of type 1 and type 2 diabetes by delaying carbohydrate digestion and absorption and enhancing insulin action. Br. J. Nutr., 97: 514-521. Hassanzadeh, E., M.R. Chaichi, D. Mazaheri, S. Rezazadeh and H.A.N. Badi, 2011. Physical and chemical variabilities among domestic Iranian fenugreek (Trigonella foenum-graceum) seeds. Asian J. Plant Sci., 10: 323-330. Jelodar, G.A., M. Maleki, M.H. Motadayen and S. Sirus, 2005. Effect of fenugreek, onion and garlic on blood glucose and histopathology of pancreas of alloxan-induced diabetic rats. Indian J. Med., 59: 64-69. Kamaljit, K., K. Amarjeet and S.T. Pal, 2011. Analysis of ingredients, functionality, formulation optimization and shelf life evaluation of high fiber bread. Am. J. Food Technol., 6: 306-313. Kang, R.K., J. Rita and D.M. Mridula, 2008. Impact of indigenous fibre rich premix supplementation on blood glucose levels in diabetics. Am. J. Food Technol., 3: 50-55. Kassaian, N., L. Azadbakht, B. Forghani and M. Amini, 2009. Effect of fenugreek seeds on blood glucose and lipid profiles in type 2 diabetic patient. Int. J. Vitamin Nutr. Res., 79: 34-39. Macedo, C.S., M.M. Lerco, S.M. Capelletti, R.J. Silva, D.O. Pinheiro and C.T. Spadella, 2007. Reduction of podocytes number in late diabetic alloxan nephropathy: Prevention by glycemic control. Acta Cirurgica Brasileira, 22: 337-341. Malaisse, W.J., 1982. Alloxan toxicity of the pancreatic B-cell a new hypothesis. Biochem. Pharmacol., 22: 3527-3534. Melin, J., O. Hellberg and B. Fellstrom, 2003. Hyperglycaemia and renal ischaemia-reperfusion injury. Nephrol. Dialysis Transplantation, 18: 460-462. Melin, J., O. Hellberg, E. Larsson, L. Zezina and B.C. Fellstrom, 2002. Protective effect of insulin on ischemic renal injury in diabetes mellitus. Kidney Int., 61: 1383-1392. Melin, J., O. Hellberg, L.M. Akyurek, O. Kallskog, E. Larsson and B.C. Fellstrom, 1997. Ischemia causes rapidly progressive nephropathy in the diabetic rat. Kidney Int., 52: 985-991. Meoro, A., F. Rivera, C.M. Gil, A. Crespo and J.J. Egea et al., 1999. Diabetic glomerulosclerosis associated with renal microscopic polyangeitis. Nephron, 83: 176-177. Mishkinsky, J., B. Joseph and F.G. Sulman, 1967. Hypoglycaemic effect of trigonelline. Lancet, 2: 1311-1312. Mishra, A., R. Bhatti, A. Singh and M.P.S. Ishar, 2010. Ameliorative effect of the cinnamon oil from Cinnamomum zeylanicum upon early stage diabetic nephropathy. Planta Med., 76: 412-417. Narender, T., A. Puri, Shweta, T. Khaliq, R. Saxena, G. Bhatia and R. Chandra, 2006. 4-hydroxyisoleucine an unusual amino acid as antidyslipidemic and antihyperglycemic agent. Bioorg. Med. Chem. Lett., 16: 293-296. Nordquist, L., E.Y. Lai, M. Sjoquist, A. Patzak and A.E. Persson, 2008. Proinsulin C-peptide constricts glomerular afferent arterioles in diabetic mice. A potential renoprotective mechanism. Am. J. Physiol. Regul. Integr. Comp. Physiol., 294: R836-R841. O'Donnell, M.P., B.L. Kasiske and W.F. Keane, 1988. Glomerular hemodynamic and structural alterations in experimental diabetes mellitus. FASEB J., 2: 2339-2347. Panes, J., I. Kurose, M.D. Rodriguez-Vaca, D.C. Anderson, M. Miyasaka, P. Tso and D.N. Granger, 1996. Diabetes exacerbates inflammatory responses to ischemia-reperfusion. Circulation, 93: 161-167. Podrazik, R.M., J.E. Natale, G.B. Zelenock and L.G. D'Alecy, 1989. Hyperglycemia exacerbates and insulin fails to protect in acute renal ischemia in the rat. J. Surg. Res., 46: 572-578. Premanath, R., J. Sudisha, N.L. Devi and S.M. Aradhya, 2011. Antibacterial and anti-oxidant activities of fenugreek (Trigonella foenum graecum L.) leaves. Res. J. Med. Plant, 5: 695-705. Rosai, J. and L.V. Ackerman, 2004. Rosai and Ackerman's Surgical Pathology, Volume 2. 9th Edn., Mosby Inc., Edinburgh and New York, ISBN-13: 9780323013420, Pages: 3135. Sampanis, C., 2008. Management of hyperglycemia in patients with diabetes mellitus and chronic renal failure. Hippokratia, 12: 22-27. Sarwar, M., I.H. Attitalla and M. Abdollahi, 2011. A review on the recent advances in pharmacological studies on medicinal plants: Animal studies are done but clinical studies needs completing. Asian J. Anim. Vet. Adv., 6: 867-883. Sauvaire, Y., J.C. Baccou and P. Besancon, 1976. Nutritional value of the proteins of a leguminous seed: Fenugreek (Trigonella foenum-graecum L.). Nutr. Rep. Int., 14: 527-537. Serebruany, V.L., W.R. Herzog, P.A. Gurbel, M.L. Schlossberg, H.J. Scott and R.A. Vogel, 1995. NPC 15669, an antiinflammatory leucine derivative, reduces in vitro platelet aggregability in both swine and human plasma. J. Thrombosis Thrombolysis, 1: 171-178. Shafrir, E. and A. Gutman, 1993. Psammomys obesus of the jerusalem colony: A model for nutritionally induced, non-insulin-dependent diabetes. J. Basic Clin. Physiol. Pharmacol., 4: 83-99. Shah, S., S. Bodhankar, R. Bhonde and V. Mohan, 2006. Combinative therapeutic approach for better blood sugar level control in alloxan diabetic mice. Int. J. Diabetes Metab., 14: 104-105. Shah, S., S. Bodhankar, R. Bhonde and V. Mohan, 2009. Regenerative potential of pancreata in alloxan induced diabetic mice by 4-hydroxyisoleucine, comparision with pioglitazone. Int. J. Integr. Biol., 5: 136-141. Shah, S.N., S.L. Bodhankar, S.L. Badole, H.V. Kamble and V. Mohan, 2006. Effect of trigonelline: An active compound from Trigonella foenumgraecum (Linn.) in alloxan induced diabetes in mice. J. Cell Tissue Res., 6: 585-590. Sharma, R.D., T.C. Raghuram and N.S. Rao, 1990. Effect of fenugreek seeds on blood glucose and serum lipids in type I diabetes. Eur. J. Clin. Nutr., 44: 301-306. Sharma, S., S.K. Kulkarni and K. Chopra, 2006. Curcumin, the active principle of turmeric (Curcuma Longa), ameliorates diabetic nephropathy in rats. Clin. Exp. Pharmacol. Physiol., 33: 940-945. Shetty, A.K. and P.V. Salimath, 2009. Reno-protective effects of fenugreek (Trigonella foenum-greacum) during experimental diabetes. e-SPEN Eur. e-J. Clin. Nutr. Metab., 4: e137-e142. Shitole, P., S.L. Badole and S.L. Bodhankar, 2009. Anti-hyperglycaemic activity of IND 01 and its interaction with glyburide and pioglitazone in alloxan induced diabetic mice. Int. J. Diabetes Metab., 17: 21-26. Singh, A.B., A.K. Tamarkar, Shweta, T. Narender and A.K. Srivastava, 2010. Antihyperglycaemic effect of an unusual amino acid (4-hydroxyisoleucine) in C57BL/KsJ-db/db mice. Nat. Prod. Res., 24: 258-265. Somasundaram, S., J. Sadique and A. Subramoniam, 1983. In vitro absorption of [14C]leucine during inflammation and the effect of antiinflammatory drugs in the jejunum of rats. Biochem. Med., 29: 259-264. Spadella, C.T., S.A. Schellini and C.E. Bacchi, 1998. Pancreas transplantation versus islet transplantation versus insulin therapy in the prevention of nephropathy in alloxan-induced diabetic rats. Transplantation Proc., 30: 327-329. Srichamroen, A., C.J. Field, A.B.R. Thomson and T.K. Basu, 2008. The modifying effects of galactomannan from canadian-grown fenugreek (Trigonella foenum-graecum L.) on the glycemic and lipidemic status in rats. J. Clin. Biochem. Nutr., 43: 167-174. Stendig-Lindberg, G., 1992. Sudden death of athletes: Is it due to long-term changes in serum magnesium, lipids and blood sugar? J. Basic Clin. Physiol. Pharmacol., 3: 153-164. Subhashini, N., G. Nagarajan and S. Kavimani, 2011. Anti-inflammatory and in vitro antioxidant property of Trigonella foenum graecum seeds. J. Pharmacol. Toxicol., 6: 371-380. Sushma, N. and T. Devasena, 2010. Aqueous extract of Trigonella foenum graecum (Fenugreek) prevents cypermethrin-induced hepatotoxicity and nephrotoxicity. Hum. Exp. Toxicol., 29: 311-319. Thakran, S., M.R. Siddiqui and N.Z. Baquer, 2004. Trigonella foenum graecum seed powder protects against histopathological abnormalities in tissues of diabetic rats. Mol. Cell. Biochem., 266: 151-159. Thakran, S., Salimuddin and N.Z. Baquer, 2003. Oral administration of orthovanadate and Trigonella foenum graecum seed power restore the activities of mitochondrial enzymes in tissues of alloxan-induced diabetic rats. Mol. Cell. Biochem., 247: 45-53. Turek, J.J., I.A. Schoenlein and G.D. Bottoms, 1991. The effect of dietary n-3 and n-6 fatty acids on tumor necrosis factor-α production and leucine aminopeptidase levels in rat peritoneal macrophages. Prostaglandins Leukotrienes Essent. Fatty Acids, 43: 141-149. Ulbricht, C., E. Basch, D. Burke, L. Cheung and E. Ernst et al., 2007. Fenugreek (Trigonella foenum-graecum L. Leguminosae): An evidence-based systematic review by the natural standard research collaboration. J. Herbal Pharmacother., 7: 143-177. Vyas, S., R.P. Agrawal, P. Solanki and P. Trivedi, 2008. Analgesic and anti-inflammatory activities of Trigonella foenum-graecum (seed) extract. Acta Pol. Pharm., 65: 473-476.
WHO, 2007. Who Monographs on Selected Medicinal Plants. World Health Organization, Geneva, Switzerland. Wald, H., H. Markowitz, S. Zevin and M.M. Popovtzer, 1990. Opposite effects of diabetes on nephrotoxic and ischemic acute tubular necrosis. Proc. Soc. Exp. Biol. Med., 195: 51-56. Wanibuchi, H., T. Fujimoto and M. Ueda, 1991. 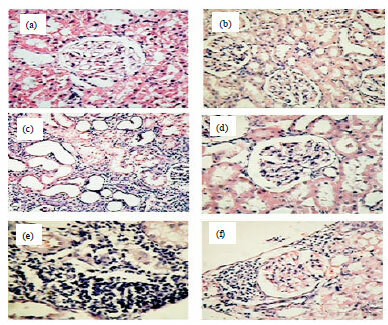 Accelerated glomerulosclerosis in alloxan-induced diabetic rabbits with anti-glomerular basement membrane nephritis. Tohoku J. Exp. Med., 163: 157-165. Winiarska, K., D. Malinska, K. Szymanski, M. Dudziak and J. Bryla, 2008. Lipoic acid ameliorates oxidative stress and renal injury in alloxan diabetic rabbits. Biochimie, 90: 450-459. Wolff, S.P., 1993. Diabetes mellitus and free radicals. Free radicals, transition metals and oxidative stress in the aetiology of diabetes mellitus and complications. Br. Med. Bull., 49: 642-652. Xue, W.L., X.S. Li, J. Zhang, Y.H. Liu, Z.L. Wang and R.J. Zhang, 2007. Effect of Trigonella foenum-graecum (fenugreek) extract on blood glucose, blood lipid and hemorheological properties in streptozotocin-induced diabetic rats. Asia Pac. J. Clin. Nutr., 16: 422-426. Yadav, M., R. Tomar, GBKS. Prasad, S. Jain and H. Yadav, 2008. Complementary hypoglycemic and anti-hyperglycemic activity of various extracts of fenugreek seeds in rats. Asian J. Biochem., 3: 182-187.